Leonard Goldberg is an American physicist, professor of medicine, and the author of the Joanna Blalock series of medical thrillers. His novels have been translated into a dozen languages and sold more than a million copies worldwide. Leonard Goldberg is himself a consulting physician affiliated with the UCLA Medical Center, where he holds an appointment as Clinical Professor of Medicine. A sought-after expert witness in medical malpractice trials, he is board certified in internal medicine, hematology and rheumatology, and has published over a hundred scientific studies in peer-reviewed journals. Leonard Goldberg's writing career began with a clinical interest in blood disorders. 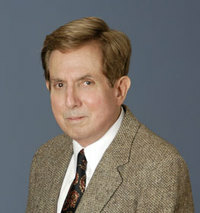 While involved in a research project at UCLA, he encountered a Leonard Goldberg is an American physicist, professor of medicine, and the author of the Joanna Blalock series of medical thrillers. Leonard Goldberg's writing career began with a clinical interest in blood disorders. While involved in a research project at UCLA, he encountered a most unusual blood type. The patient’s red blood cells were O-Rh null, indicating they were totally deficient in A, B and Rh factors and could be administered to virtually anyone without fear of a transfusion reaction. In essence, the patient was the proverbial "universal" blood donor. This finding spurred the idea for a story in which an individual was born without a tissue type, making that person’s organs transplantable into anyone without worry of rejection. His first novel, Transplant, revolved around a young woman who is discovered to be a universal organ donor and is hounded by a wealthy, powerful man in desperate need of a new kidney. The book quickly went through multiple printings and was optioned by a major Hollywood studio.